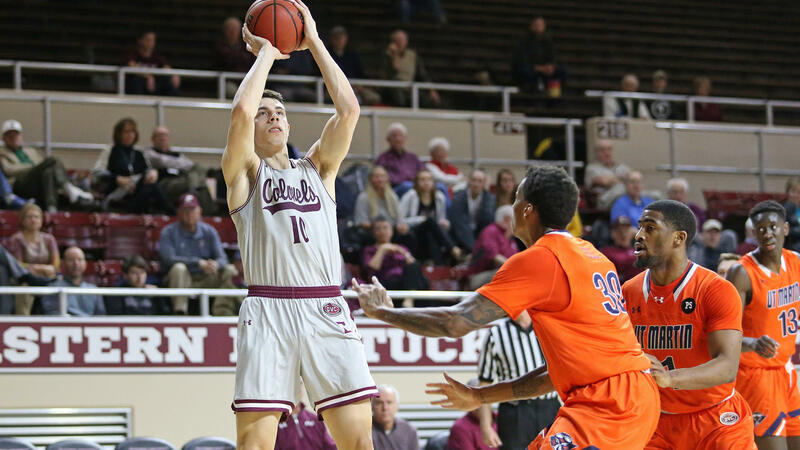 The Eastern Kentucky University men’s basketball team opens up its regular season Wednesday against a very tough opponent. Marshall comes into Alumni Coliseum, off of a record setting season last year and with many returning players. First year EKU Coach A. W. Hamilton understands the challenge for his team. “Their backcourt is…I don’t know if there is a better backcourt in the country. Both of them averaged 20 points a game. I think both of them next year will be on NBA teams, so they got an incredible team. They’re returning seven of their top eight and they’re coming off their best season in program history,” said Hamilton. Hamilton says he and his team have been out churning up support for the Colonels. He says that included door to door activities with 2000 door hangers distributed. Hamilton says Eastern’s senior center Nick Mayo will be a key component of his squad this season. “He is the centerpiece to our team. Last year he only took 12 shots a game. If we’re gonna really have a chance at winning, he’s going to have to take 15 to 18 shots a game, so we’re going to move him all over the court. We’re going to try to get him open looks. We’re going to try to get him to the free throw line,” noted Hamilton. Tipoff is set for seven Wednesday evening. While the men open up tonight with the Thundering Herd, the EKU women’s team takes on St. Louis this Friday at noon at home.